Upper Motor Neurons (UMN): cells originating in the motor cortex of the brain which travel down through the brainstem and spinal cord where they synapse with the lower motor neurons. It is also known as Amyotrophic Lateral Sclerosis (ALS) or Lou Gehrig’s Disease in the US, named after the famous American Baseball player who succumbed to the disease. With no residual muscles or strength, MND patients are left motionless, mute, and trapped within their once active bodies. In the majority, the mind and intellect are left intact, with the sufferer bearing witness to it all. For each year they live, every MND patient will on average require $31,598 worth of equipment. The average lifespan is between 2-5 years so this equates to an average lifetime cost of between $63,196 and $157,990 in equipment needs alone*. Carer, hospital expenses, loss of income, home modifications, wheelchair accessible vehicles, medication costs etc, are all above this. Estimated cost to live with the disease is around $200,000 per year depending on level of disability and needs of the individual. Source: Economic Analysis of MND in Australia 2015 report for Motor Neurone Disease Australia, Deloitte Access Economics. What Are The Causes Of MND? For many patients the onset of MND may be difficult to pinpoint and many of the earliest signs and symptoms are commonly overlooked or dismissed as related to another cause. Some of the earliest symptoms may include fasciculations (muscle twitches), cramps, tight and stiff muscles, muscle weakness affecting an arm or a leg, slurred and nasal sounding speech, or difficulty chewing or swallowing. One of the cardinal features of MND is that overtime these symptoms progress, worsening in severity and also spreading to other areas of the body. These features often may lead to your doctor suspecting MND. Many individuals first see the effects of the disease in a hand or arm as they experience difficulty with simple tasks requiring manual dexterity such as buttoning a shirt, writing, or turning a key in a lock. In other cases, symptoms initially affect one of the legs, and people experience awkwardness when walking or running or they notice that they are tripping or stumbling more often. Regardless of the part of the body first affected by the disease, muscle weakness and atrophy spread to other parts of the body as the disease progresses. Individuals may develop problems with moving, swallowing (dysphagia), and speaking or forming words (dysarthria), as well as muscle spasticity, exaggerated reflexes, muscle weakness and atrophy, muscle cramps and fasciculations. Although the sequence of emerging symptoms and the rate of disease progression vary from person to person, eventually individuals will not be able to stand or walk, get in or out of bed on their own, or use their hands and arms. Difficulty swallowing and chewing impair the person’s ability to eat normally and increase the risk of choking. Maintaining weight will then become a problem. Because cognitive abilities are relatively intact (cognitive changes are described in between 30% – 50% of cases), people are aware of their progressive loss of function and may become anxious and depressed. A percentage of individuals may experience problems with memory or decision-making, and there is growing evidence that some may even develop a form of dementia over time. Health care professionals need to explain the course of the disease and describe available treatment options so that people can make informed decisions in advance. In later stages of the disease, individuals have difficulty breathing as the muscles of the respiratory system weaken. They eventually lose the ability to breathe on their own and must depend on ventilatory support for survival. Affected individuals also face an increased risk of pneumonia during later stages of MND. Older Age: MND is rare before the age of 40 years and increases exponentially with age therafter. Mean age of onset is 58-63 years for sporadic MND and 40-60 years for familial MND, with a peak incidence in those aged 70-79 years old. Family History of MND: About 10% of MND cases are transmitted in families, almost always as a “dominant trait” and frequently with high penetrance – this means that the offspring from an affected person has a 50% chance of inheriting the faulty gene, and if they do, there is a very high chance they will develop MND. If no family history of MND is identified, the diagnosis is assumed to be sporadic. The C9ORF72 gene (the function of which is as yet unknown) is located on chromosome 9 is the most common gene mutation associated with familial/inherited MND accounting for up to 40% of familial MND cases ( and up to 7%-11% of sporadic MD cases). 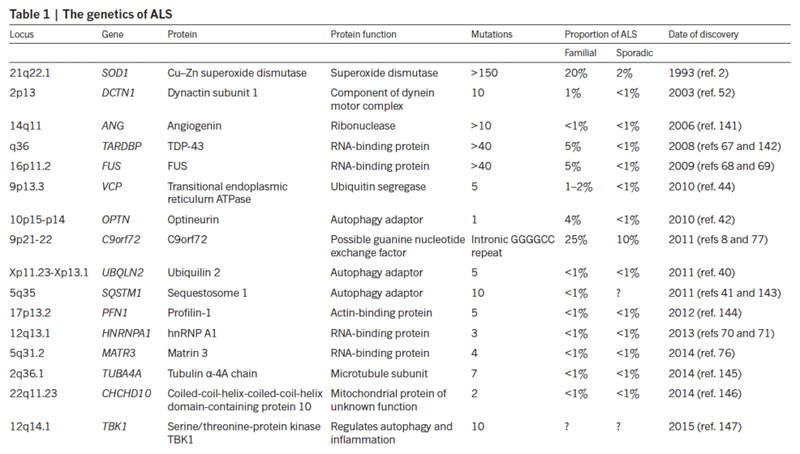 Mutations in the SOD1 gene are found in 10-20% of familial MND cases (and between 1%-5% of sporadic MND cases). Smoking: According to an evidence based medical analysis, smoking is the only probable risk factor for MND (Source: Armon C. Smoking may be considered an established risk factor for sporadic ALS. Neurology. 2009;73(20):1693–1698). Intriguingly, smoking may be a risk factor among women, especially post-menopausal women for yet not understood reasons. Dietary Factors: The most investigated relationship between dietary factors and MND is the inverse association between higher intake of antioxidants and a lower risk of MND, with inconsistent findings across studies for any definitive conclusions to be drawn. Body Mass Index and Physical Fitness: There is a strong clinical impression that MND patients have a higher level of physical fitness and lower BMI than average at diagnosis. Longitudinal cohort studies have also suggested that low pre-diagnosis BMI is associated with a high risk of and greater mortality from MND. Athleticism, Chronic Traumatic Encephalopathy, and Physical Exercise: Several studies have demonstrated an increased risk of MND among soccer players, other athletes, and individuals who engage in vigorous physical activity. Chronic Traumatic Encephalopathy (CTE) which results from repeated head injuries, has also been proposed as the underlying reason for the diagnosis of MND among professional athletes. Occupation: workers in various occupations with seemingly unrelated exposures have been reported to be potentially at risk of MND including athletes, carpenters, construction workers, house painters, laboratory technicians, leather workers, metal workers, tobacco workers, veterinarians, and welders. These occupations potentially involve work exposures to chemicals, pesticides, metals, and electromagnetic fields, but a common denominator between them has not been identified. Metals: links between exposure to lead, iron, sellenium, copper, aluminium, arsenic, cadmium, cobalt, zinc, vanadium, and uranium have been reported, with increased levels of all these compounds reported in some MND patients relative to control subjects. Pesticides: are in widespread use around the world, and several studies have shown an association between pesticide exposure and MND (particularly organochlorine compounds, pyrethroids, herbicides, and fumigants specifically). β-methylamino-L-alanine : exposure to β-methylamino-L-alanine (BMAA), an atypical amino acid, has been proposed to explain the high incidence of MND (and other neurodegenerative conditions) in the western Pacific. BMAA is produced by cyanobacteria, and elevated levels have been reported in the brain and spinal cords of patients with MND compared to healthy controls or patients with other diseases. Viruses: recent studies of the expression of human endogenous retroviral sequences have revealed significantly increased expression of HERV-K in the serum, muscle, and post mortem brain tissue of MND patients. To be diagnosed with MND, people must have signs and symptoms of damage to either or both of the upper and lower motor neurons that cannot be attributed to other causes. 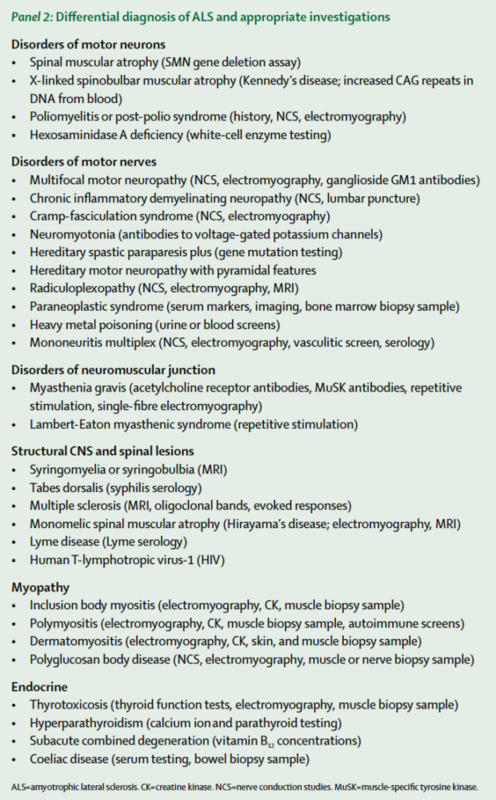 No single test can provide a definitive diagnosis of MND; instead, the diagnosis of MND is primarily based on the symptoms and signs the neurologist observes in the patient and a series of tests to rule out other diseases. 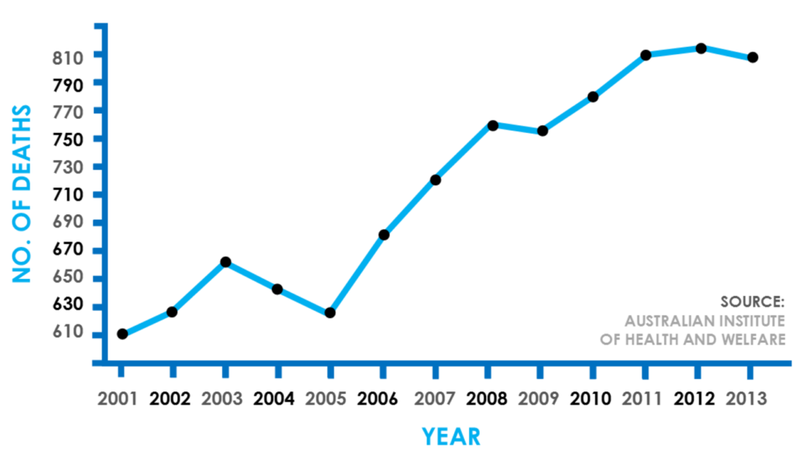 Sometimes the patient is observed to see if the symptoms and signs progress over time (one of the cardinal features of MND). Physicians obtain the individual’s full medical history and usually conduct a neurologic examination at regular intervals to assess whether symptoms such as muscle weakness, atrophy of muscles, hyperreflexia and spasticity are getting progressively worse. Since MND symptoms in the early stages of the disease can be similar to those of a wide variety of other, more treatable diseases or disorders, appropriate tests must be conducted to exclude the possibility of other conditions. One of these tests is electromyography (EMG), a special recording technique that detects electrical activity in muscles. Certain EMG findings can support the diagnosis of MND. Another common test is a nerve conduction study (NCS), which measures electrical energy by assessing the nerve’s ability to send a signal. Specific abnormalities in the NCS and EMG may suggest, for example, that the individual has a form of peripheral neuropathy (damage to peripheral nerves) or myopathy (muscle disease) rather than MND. The physician may order magnetic resonance imaging (MRI), a noninvasive procedure that uses a magnetic field and radio waves to take detailed images of the brain and spinal cord. Standard MRI scans are normal in people with ALS. However, they can reveal evidence of other problems that may be causing the symptoms, such as a spinal cord tumor, a herniated disk in the neck that compresses the spinal cord, syringomyelia (a cyst in the spinal cord), or cervical spondylosis (abnormal wear affecting the spine in the neck). Based on the person’s symptoms and findings from the examination and from these tests, the physician may order tests on blood and urine samples to eliminate the possibility of other diseases as well as routine laboratory tests. In some cases, for example, if a physician suspects that the individual may have a myopathy rather than MND, a muscle biopsy may be performed. Infectious diseases such as human immunodeficiency virus (HIV), human T-cell leukemia virus (HTLV), polio, West Nile virus, and Lyme disease can cause MND-like symptoms in some cases. Neurological disorders such as multiple sclerosis, post-polio syndrome, multifocal motor neuropathy, and spinal muscular atrophy also can mimic certain facets of the disease and should be considered by physicians attempting to make a diagnosis. Fasciculations, the fine rippling movements in the muscle, and muscle cramps also occur in benign conditions. Because of the prognosis carried by this diagnosis and the variety of diseases or disorders that can resemble MND in the early stages of the disease, individuals may wish to obtain a second neurological opinion. Unfortunately, at present there is no known cure to Motor Neurone Disease (MND). The first approved drug treatment for the disease, called Riluzole (Rilutek), became avalable in 1995. Riluzole is believed to reduce damage to motor neurons by decreasing the release of glutamate. Clinical trials with MND patients showed that Riluzole prolongs survival by around 3-4 months, mainly in those with difficulty swallowing. The drug could also extend the time before an individual needs ventilation support. Riluzole does not reverse the damage already done to motor neurons, and persons taking the drug must be monitored for liver damage and other possible side effects. Other treatments for MND are designed to relieve symptoms and improve the quality of life for individuals with the disorder. This supportive care is best provided by multidisciplinary teams of health care professionals such as neurologists; pharmacists; physical, occupational, and speech therapists; nutritionists; and social workers and home care and hospice nurses. Working with patients and caregivers, these teams can design an individualized plan of medical and physical therapy and provide special equipment aimed at keeping patients as mobile and comfortable as possible. Physical therapy and special equipment can enhance an individual’s independence and safety throughout the course of MND. Range of motion and stretching exercises can help prevent painful spasticity and shortening (contracture) of muscles. Physiotherapists can recommend exercises that provide these benefits without overworking muscles. Occupational therapists can suggest devices such as ramps, braces, walkers, and wheelchairs that help individuals conserve energy and remain mobile. People with MND who have difficulty speaking may benefit from working with a speech therapist. 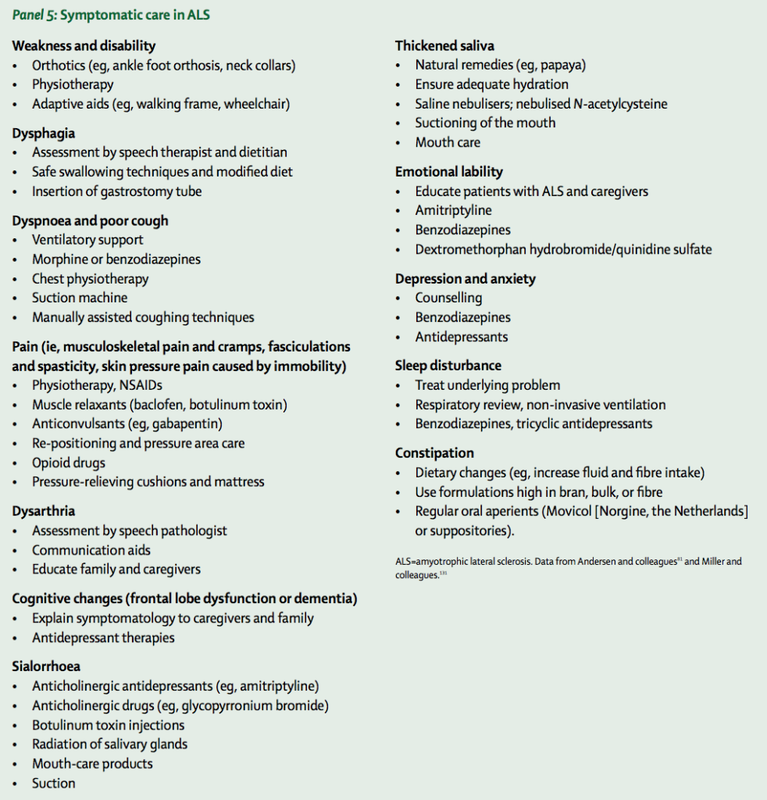 These health professionals can teach individuals adaptive strategies such as techniques to help them speak louder and more clearly. As MND progresses, speech therapists can help people develop ways for responding to yes-or-no questions with their eyes or by other nonverbal means and can recommend aids such as speech synthesizers and computer-based communication systems (so called Augmentative and Assistive Communication Devices AAC). These methods and devices help people communicate when they can no longer speak or produce vocal sounds. Nutritional support is an important part of the care of people with MND and it is important that those diagnosed with MND maintain diets that provide enough calories, fiber, and fluid. The use of a feeding tube (PEG tube) also reduces the risk of choking and pneumonia that can result from inhaling liquids into the lungs. The tube is not painful and does not prevent individuals from eating food orally if they wish. Social workers may help patients, families, and caregivers with the medical, emotional, and financial challenges of coping with MND. A palliative care referral may be made at some point in a patients course, to ensure adequate symptom control.